The Israel Mobile Association (IMA) Pavilion at MWC Barcelona 2019 provides its members with an important hub to meet potential new customers. Spread across two large spaces – 112m² & 160m² – in the Fira Gran Via, the brief was to create an impactful series of booths with attractive meeting & sales areas combined with a central welcome & hospitality hub. 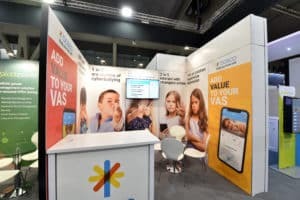 However all the designs had to meet strict venue regulations including an embargo on large hanging banners as well as a meet the requirement that the majority of the space should be enclosed. Working closely with the IMA, we created a series of co-exhibitor packages offering different level of space, graphics, furniture & AV-IT. These ranged from simple branded seating areas to private enclosed meeting rooms & custom-built zones. 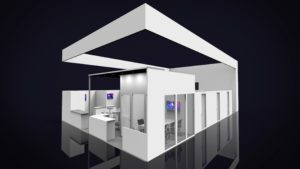 Once 19 co-exhibitors had been confirmed, we produced a comprehensive floor plan & layout, before creating the final 3D designs & renders. In absence of a hanging banner, a 16m x 12m header was incorporated to height & brand presence. While the enclosed rooms were kept light & airy by using a combination of Foamex graphics & inset branded acrylic panels. A bespoke welcome desk gave the IMA team a focal point to manage the many pre-booked delegate-member meetings. While guests were drawn to the large rear networking area with it’s eye-catching LEDskin panel video wall & custom-made bar. 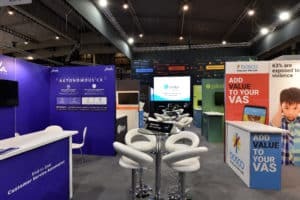 Our Client Services team dealt directly with each co-exhibitor on every element of their space. From providing artwork guidelines & 3D proofs to organising extra furniture & AV/IT via our online catalogue, & even transporting merchandise & marketing materials. They also coordinated all the on-screen video presentations, enabling them to be tested & uploaded before the clients arrived. Following a smooth installation, the Pavilion was handed over to a happy & relaxed client 24 hours before MWC Barcelona opened. Throughout the exhibition our At-Show Support team ensured everything ran smoothly from re-stocking the catering supplies, helping behind the bar during a drinks reception to keeping the stand sparkling clean. 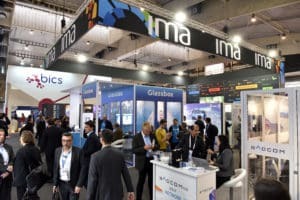 Did you find the ideas in the ‘IMA Pavilion at MWC Barcelona 2019‘ case study interesting?